One of the most intimidating—and one of the most common—scenes you’ll typically see during a major hurricane is footage of windows being pulverized and decimated by high-force winds. This could in turn lead to dangerous shards of glass being hurled through the air, putting a building’s occupants at risk of being severely injured or killed. One of the measures that building owners can take to mitigate that risk is to install a 3M Safety & Security Film. Security films work by holding glass together after it shatters, which can be extremely useful not just during a hurricane as powerful as the recent Hurricane Florence, but also during an attempted break-in, as it becomes much more difficult for would-be intruders to smash through the window. 3M Safety & Security Films also block 99% of the ultraviolet light, which is responsible for about 40% of the fading of interior furnishings. In that respect, security films are among the most useful films around—if you’d like to make your home or office more secure during powerful coastal storms and hurricanes, would like to significantly lower the odds of being broken into by a potential intruder, and would like to address the damage being inflicted on your floors and furniture by the sun’s harmful ultraviolet rays, 3M Safety & Security Films can help you accomplish all three goals at the same time. What’s more, there are both tinted and non-tinted versions of 3M security films. So if you’d prefer to keep your windows looking as light and natural as they do now, you could simply choose to install a non-tinted security film that gives you all of the aforementioned benefits without darkening the windows. However, if you’re experiencing excessive solar heat or glare, you could instead choose to go with a tinted security film that addresses both of those problems as well. To schedule a free estimate, or to find out the answers to any questions you might have about security films, just give us a call at 215-657-1000! 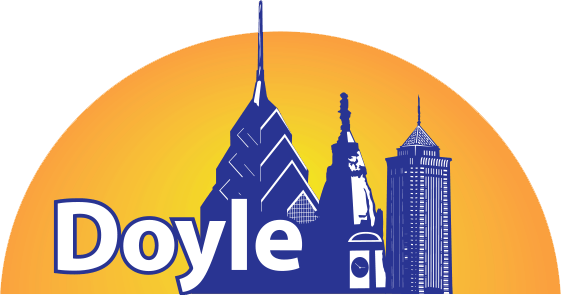 Doyle Window Tinting is the Delaware Valley’s Largest 3M Window Film Dealer. For over 30 years, we have proudly provided our clients in the residential, commercial and government markets with 3M window film products that meet their needs and exceed their expectations. To learn more about window film or to schedule an appointment for a free estimate, give us a call today at (215) 657-1000 or get in touch online using our contact form.